Samford University’s School of the Arts and Dawson Memorial Baptist Church will host one of America's most respected church musicians and teachers, Dr. John Ferguson, as guest lecturer in music and worship Feb 28-March 3. 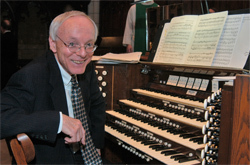 Ferguson recently retired from St. Olaf College, where he served as the Eliot and Klara Stockdahl Johnson Professor of Organ and Church Music and Cantor to the Student Congregation. He has been invited as a visiting professor by the faculties of the University of Notre Dame and the Yale Institute of Sacred Music. Dr. Ferguson is respected as a fine teacher and performer, and his work as an improviser and leader of congregational song has received national acclaim. Each year he presents many hymn festivals across the country, both for local congregations and professional gatherings. He is the author of three books, numerous articles and has a large number of published organ and choral compositions. Feb. 28–Ferguson will speak at the Samford Worship Exchange, a gathering of musicians and pastors in the Birmingham area. March 1–Ferguson will serve as organist for the Choral Vespers service in Hodges Chapel at 5:30 p.m. Samford’s A Cappella Choir Vespers will join Ferguson for several of his own anthems and arrangements. March 2–Ferguson will lead an organ master class in Samford’s Reid Chapel from 10 a.m. to noon. March 3–Ferguson will serve as organist in the 9:40 a.m. and 11 a.m. worship services at Dawson Memorial Baptist Church, and join with the Dawson Sanctuary Choir and Brass Ensemble for a 6 p.m. hymn festival featuring his compositions and arrangements. All of the events are free-of-charge and open to the public. For information, contact Eric Mathis at (205) 726-2323 or emathis@samford.edu.